Johnny Erdman, a baritone player with the Vanguard Cadets in 2006, sent this picture. This is a picture of a group of former members of the Fremont High School Firebird Marching Band from Sunnyvale, Calif. We met up on the field of Camp Randall Stadium (Madison, Wis.) after the 2006 Division II & III World Championship Finals for a group picture to send to our former band director, Joe Kelly. 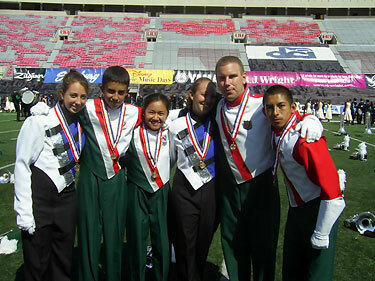 From left to right: Kristi Dyer (Blue Devils B, 2005-2006), Justin Cunha (Vanguard Cadets, 2005-2006), LightKim Quach (Vanguard Cadets, 2005-2006), Jessica Dyer (Blue Devils B, 2005-2006), Johnny Erdman (Vanguard Cadets, 2006), Jorge Mora (Vanguard Cadets, 2005-2006).